The GOV.UK content team is responsible for updating over 3,200 pieces of content (what we refer to as mainstream content). The content team is made up of about 25 content designers, supported by 2 delivery managers, 2 performance analysts, 3 trainers, a community manager, a content analyst, a developer and the Head of Content. On GOV.UK, the content we manage gets looked at the most and covers tasks that citizens and small businesses are likely to do - everything from applying for a passport, to getting your driving licence to paying your tax. We also direct feedback and questions on content from the public to departments to help make our content better for users. From December 2014 to December 2015, we received 7,925 tickets. Most of those are from government. The green, purple and lightest blue are all government tickets, but solved in different queues. The darker blue represents our public tickets that we read to see if we need to make any changes to content, or just direct people to relevant content. The light purple bits represent a queue that we closed when we merged teams back in May. 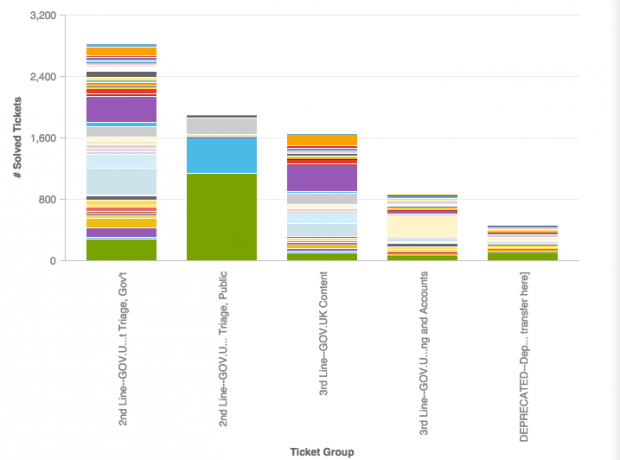 You can also see the seasonal variation - with the peak of government tickets coming in July. We have a rota for managing the amount of requests that come in every day. The content designer’s main job when they’re on the rota is to make sure changes are made, moved to the 3rd line queue (and icebox), or replied to and closed. We solve roughly 60% of government tickets and 95% of public tickets in our triage - this means it never has to get put into a sprint. The way we determine if it can be solved in our triage is to estimate if it will take about 10 to 15 minutes to make the content change and send it through our review process. Any agency and department can send us a request - but we’re more likely to get requests from departments when it comes to mainstream content. If a department has lots of content that relates to their area of work, they’re more likely to send us more requests. Every line on the graph below is a different agency or department who has made a request in the last 12 months. Most of these organisations have either a lot of editors or a lot of mainstream content that relates to their area of government, so we expect them to have to interact with us more often. The big blue and green group in the public triage column are all members of the public - broken down by those who submit tickets anonymously and those who leave their email address. We haven’t changed how we manage our requests in a few years, so in the new year we’re planning to revisit our processes to make sure we can get through tickets even faster. Our aim is to raise tickets solved in our triage from 60% to 80%. This means, everything that would otherwise get sent to our 3rd line would be solved in a month or less. This was our first full year after the transition of all the agencies and arms length bodies to GOV.UK. We’ll be keeping a close eye on the ticket volumes next year to see if this is our new normal or if just a post-transition bump. Liz Lutgendorff is the GOV.UK Content Analyst.